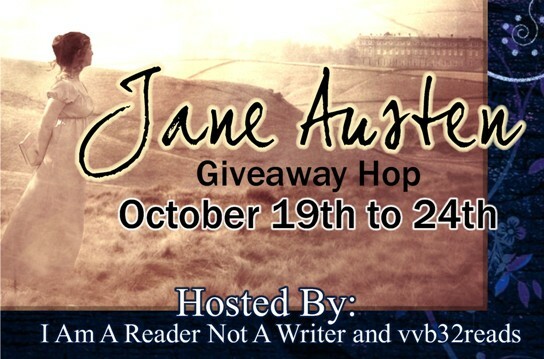 Welcome to my Jane Austen inspired giveaway, hosted by I Am A Reader Not a Writer and vvb32reads! 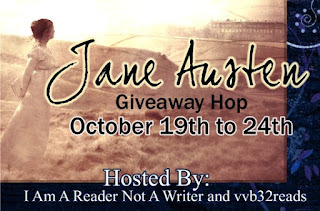 Fill out the form below to enter to win a Jane Austen inspired book from the Book Depository (up to $15) and check out the links below for the rest of the people participating in the hop! Pride and Prejudice:) Though recently I began to appreciate Persuasion as well. I dont have one! :( I havent read any of her books yet! Thank u for this awesome giveaway. My favorite book is Pride and Prejudice, but I also love Emma, Sense and Sensibility and Northanger Abbey. Love her heroine characters. There are still so many Austen inspired books on my wishlist :D I love especially the ones with a bit of P&P, my all time fav Austen romance. My favourite is Pride and Prejudice. My favorite Jane Austen book is "Pride & Prejudice"! My GFC name is ParentingAuthor. I love Pride & Prejudice best, too. Elizabeth and Mr Darcy are incomparable!!! I'm a new follower! Yay! Thanks for the giveaway opportunity. My fav is Persuasion, but Mansfield Park runs it a close second. My fav is Pride and Prejudice... ahhh Mr. Darcy! P&P followed by Persuasion. Thanks for the giveaway. I have only read Emma, and I loved it! Thanks for the giveaway! Very generous and what a good idea. People like to have choices and a good variety at that. My favorite novel is Persuasion. There are so many Austen inspired books however that it's really hard to narrow down that category. Love the gift of choice. My favorite is Pride and Prejudice but Persuasion also holds a dear spot in my heart. Thanks for the giveaway! My favorite Jane Austen book is Pride & Prejudice. Shamefully only read Pride and Prejudice so far so that is my fave! Pride and Prejudice! Loved every single thing about it. Pride & Prejudice - of course! My favorite Jane Austen book is Pride and Prejudice, always and forever. My favourite Jane Austen novel is Persuasion! =) Thanks for the giveaway! I love Sense & Sensibility. Thanks for the giveaway! Pride and Prejudice for sure. I love P/P and Emma! Sense & Sensibility. Pride & Prejudice. Thanks! Pride and Prejudice and Sense and Sensibility. can't decide, i love pride and prejudice but then i also love persuasion! To tell you the truth, I have not read Jane Austen until finished. I'm still trying reading Pride & Prejudice. I still haven't read her book yet, but i have her book, Pride & Prejudice. Pride and Prejudice. Thanks so much for the giveaway. Pride and Prejudie is my favorite. I love Persuasion! You can't beat that letter! I haven't read many and its been awhile so I can't think of a favorite. Thanks for the giveaway! I love Sense and Sensibility! I haven't read any Jane Austen books yet! Pride and Prejudice is number one and Persuasion is second, but all are so good it is hard to pick. Pride and Prejudice is my favorite book. What's your favorite Jane Austen Book? My Favorite Is Sense and Sensibility. always Persuasion for me ! LUV IT ! appreciate your generosity & luv your choice of giveaway offer! I haven't read any, but I love the movie version of Pride and Prejudice! I could watch it a million times :) Thanks for the giveaway! !